Hello and welcome to the Northcote R.E page. 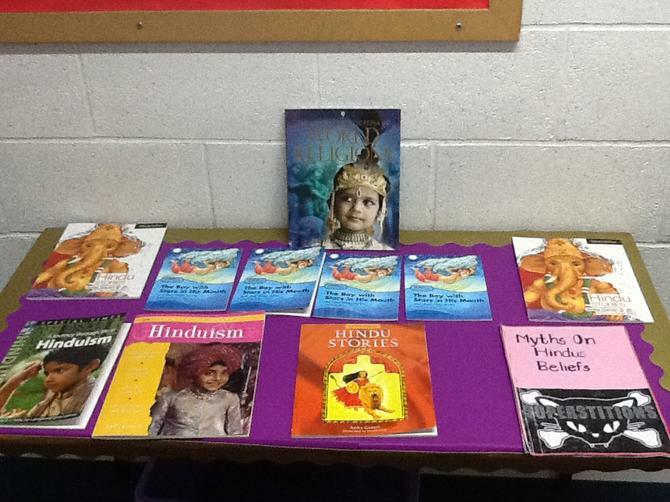 At Northcote, we base our work on six religions: Christianity, Hinduism, Sikhism, Islam, Buddhism and Judaism. 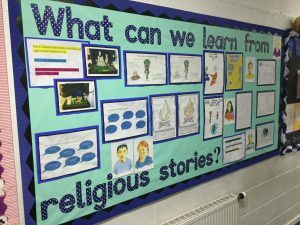 Our work is based around how people worship in each religion, we read religious stories and discover how we can learn from each religion. Our R.E. coordinator is Mr McMurtry if you have any questions do not hesitate to speak to a member of staff. Our Northcote Curriculum is designed with the intent to maximise potential of all of our pupils; intellectually, socially, morally, emotionally and culturally. We take every opportunity to encourage a love for learning within all of our pupils, based around a resilience for learning and achieving greatness. Most importantly we allow our children to learn in a safe and stimulating environment, where their views are valued. Implementation – RE is delivered as part of our ‘Social Values Curriculum’. RE is delivered through both discrete lessons and lessons in other areas of the social values curriculum. We learn about the six main religions of the world, with an emphasis on how we learn from religion and it can be related to children’s lives. We complete work both in a written format, as well as giving children the opportunity to partake in art, drama, discussion and computing. As the children move through the school, they begin by learning about different religions and places of worship and festivals. They begin to recognise that religious teachings and ideas can make a difference to individuals and families. 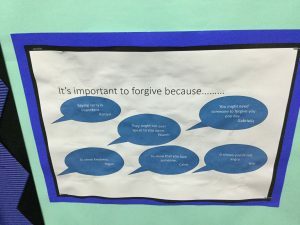 They reflect on how spiritual and moral values relate to their own behavior. 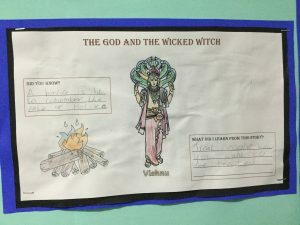 Children read religious stories to support this, in addition to using drama and role play. 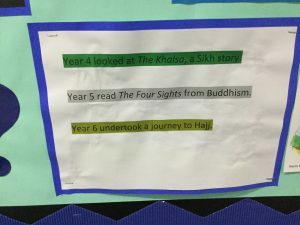 As the children move through the school, children deepen their knowledge of religions and progress by linking this to their own lives. 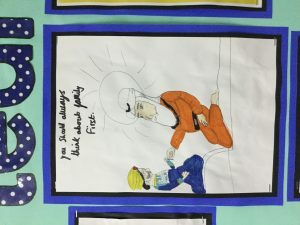 They are asked to consider how religions can support pupils when reflecting upon ideas of right and wrong and their own and others’ responses to them. 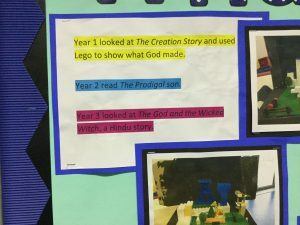 Children are also encouraged to discuss their own and others’ views of religious truth and belief, expressing their own ideas. This is encouraged through discussions in the classroom and has strong links to P4C. Children in RE are taught in mixed ability groups and have a floor book to show work output. Floor books have been introduced to encourage collaborative work and promote speaking and listening skills. Children are encouraged to share ideas with their peers and adult support is used to help children with more difficult religious concepts. Staff are trained internally by the RE coordinator of any new developments in the subjects and given insight into new resources that may be of use in the classroom. The RE coordinator attends RE courses offered by the local authority. Our school works in collaboration with 6 other local schools; here the subject leaders meet and discuss aspects of the RE curriculum, sharing good practice and ideas for purposeful teaching and learning. RE is allocated time during foundation sessions, occasionally teachers may prefer to teach a unit in a block to strengthen a particular topic. The Northcote prayer is a weekly feature of the KS1 and KS2 assemblies, reinforcing morals and values expected from all pupils. RE is given a yearly budget and this is spent on a range of resources that can support learning in the classroom. Throughout the school, all year groups focus on the resurrection at Easter and the birth of Christ at Christmas. This links to drama and these are performed to the whole school community. Impact – At the end of each topic, children are able to produce a task that shows their understanding – these are evidenced in the RE big books. Subject and school leaders monitor the impact of our curriculum provision through completing regular monitoring, that includes listening to the voice of our children. What can we learn from Religious Stories? We have read religious stories and learnt from different religions. 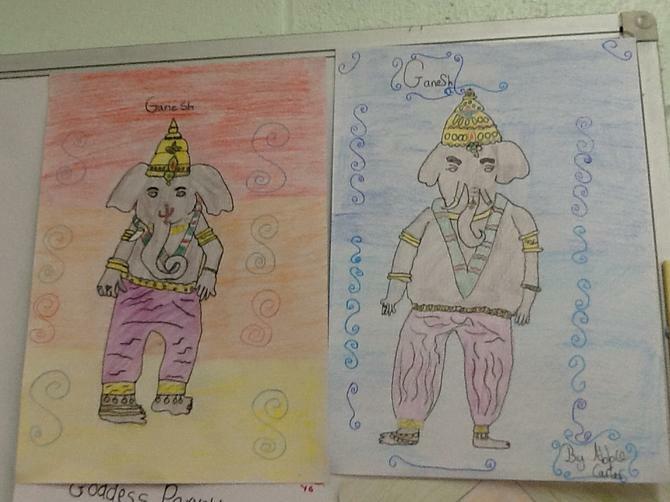 Y6 art work on Hindu Gods. 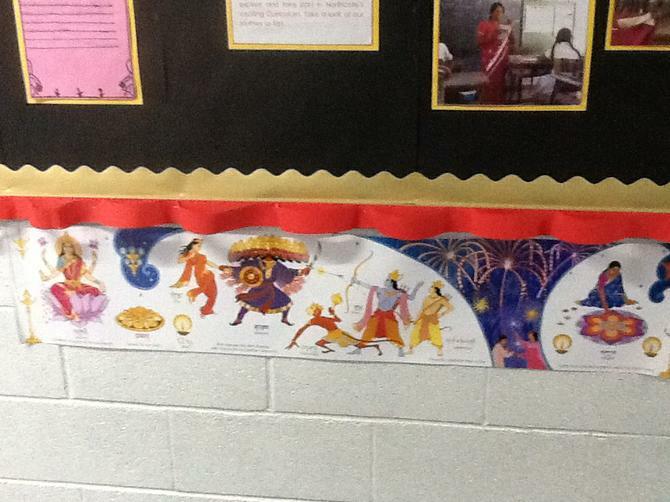 October 2014 Connecting Classrooms Visit: Work on Hinduism. Find out more about Hinduism, the religion the pupils worship in our linked school, Pakkiyam National College. At Northcote, we follow the Liverpool agreed syllabus for Religious Education.